Good news! Emerging research from the University of Florida (UF) in Gainesville shows that low-cost and no-cost pet adoptions yield the same great, committed homes for pets as pricier transactions. Ironically, at Gainesville's Alachua County Animal Services (ACAS), strict administrative restrictions and rules prevented staff from implementing these strategies to increase lifesaving. It had been a long-standing policy at ACAS to require full-fee adoptions for almost all pets. The rationale from the county's budget and accounting department was that the animals were being counted as "assets" that could not just be given away. Why was this bad? Well, for one thing, it did not allow ACAS to incentivize adoptions or market harder-to-place animals with lower fees. It was certainly not aligned with current research supporting fee flexibility. Over time it was costing, not saving, the county money as animals got sick in the shelter, requiring more and more veterinary services, more days of shelter care costs and ultimately the cost of euthanasia. Especially urgent for our community: without the option to offer free adoptions, ACAS wouldn't be able to participate in Maddie's® Pet Adoption Days on June 1st and 2nd, 2013. As part of our ten-year-old Maddie's Fund® community collaboration, we've developed and refined our outreach tactics to improve conditions for Alachua County's animals. In this case, we asked our team to meet with county officials to see if we could change their minds and policies regarding free adoptions. We carefully selected the representatives most likely to be heard by policymakers: Dr. Julie Levy, a professor at the UF College of Veterinary Medicine and a renowned research scientist; and Gladys Cofrin, a prominent local philanthropist and animal advocate whose family has funded museums, parks and major projects in the community. 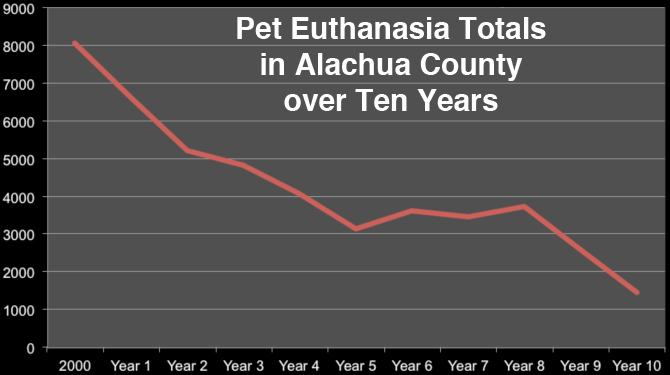 In 2002, the Alachua County Commission signed on to our mission to end needless pet euthanasia. But because we had several newly-elected commissioners, we knew it was important to provide them with enough background and history to put our request for a policy change in context. As the Maddie's Fund Project administrator, I provided community statistical reports (always in the form of easy-to-read charts and graphs) that demonstrated how the proposed change was part of a comprehensive and effective strategy. Thanks to what we've learned from Maddie's Fund, we had detailed reports showing that our approach has been effective in reducing deaths by almost 90% over ten years! We met individually with each of the five commissioners, tailoring our presentation to what we knew about the interests and preferences of each. We were ready for questions and conversations about side issues that had the potential to distract the discussion and derail our request. For example, we knew one commissioner would bring up our high-profile TNR programs and their impact on wildlife, so Dr. Levy was ready with the latest research and statistics to answer those questions quickly and get us back on track. We knew that one commissioner would be focused on costs to taxpayers, and we brought her detailed cost/benefit analysis. We were able to demonstrate how saving lives at ACAS was also saving county taxpayer dollars through clear and realistic cost calculations. We encountered concerns from commissioners who had heard the old-school beliefs that free or low-fee adoptions led to adopters who were not committed or did not value their new pets. Thanks to the November 2012 study published by Maddie's® Shelter Medicine Program at the University of Florida, we were able to cite research-based evidence that fee-waived adoptions yield positive, long-term outcomes for pets. While there were many areas where policymakers could improve our animal welfare system, for this project we focused on a single specific request of commissioners that did not require any county funding at all: to support adoption fee flexibility and give the Animal Services Director authority to try different fee-based strategies to increase lifesaving at ACAS. Most importantly, we approached each commissioner in a respectful, non-confrontational manner and calmly acknowledged their objections and concerns. Community education is one place where the passions of animal rescuers must be carefully targeted. Although it can be frustrating to try to persuade folks who don't understand the importance of our lifesaving mission, nobody responds well to being shouted at or harangued. And lawmakers need solid evidence and reliable statistics to justify their decisions to other groups within the community. "Because it's the right thing to do" isn't always enough. The outcomes to our efforts appeared quickly. Within a week of our visits, the commissioners were quoting our statistics and research in public county meetings to support their direction to county staff to implement fee flexibility! Our Animal Services Director was given immediate authority to implement fee-based strategies, and his staff began planning reduced-fee adoption promotions the same week. We believe that our efforts to change county policy were successful because we took the time to learn about commissioners' concerns, prepared solid research and statistical evidence to back up our claims, and we addressed objections calmly and respectfully. We understood that government leaders have many urgent issues competing for their attention and that animal welfare is not at the top of everyone's priority list. Our job was to persuade them that our requested change would be good for everyone in the community, not just the animal lovers. And we took time to let them talk: to tell us about their own pets and experiences with adoption, to show us photos of their dogs and cats and to gradually become part of our team as we shared the things we have in common. We are thrilled that ACAS will be a full partner in our community's goal to empty every shelter and find a home for every pet during Maddie's® Pet Adoption Days. And we are so proud of our community for stepping up to the plate and being ready to communicate and compromise to make good things happen for every human and animal citizen in Alachua County. For a detailed list of tips for animal advocacy work with government officials, check out Kim Wolf's Stubbydog.org blog entry: 10 Tips for Attending a City Council Meeting or Public Hearing Where Discriminatory Dog Laws are Being Discussed. Jeannette Peters of Nonprofit Management Consulting LLC in Gainesville, FL is an organizational development specialist working with a wide variety of community-based programs throughout the United States to improve effectiveness and performance. She has served as coordinator for Maddie's® Project in Alachua County since 2002. Jeannette has managed a number of large-scale federal and state-funded projects and has secured more than $21 million in grant funding for her clients since 1995. A former attorney and journalist, Jeannette frequently serves as a federal grant reviewer in Washington, DC for the Department of Health and Human Services, the Department of Education and the Corporation for National and Community Service.